от 19 шт. — 170 руб. 270 руб. 190 шт. 2-3 недели 5 шт. 5 шт. от 50 шт. — 156 руб. Texas Instrument&apos;s range of remote & local temperature sensors measure their own temperature and that of one or more external devices. 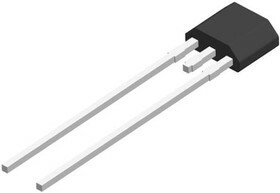 Examples of external devices could be <B>thermal diodes</B> contained within microcontrollers, microprocessors or FPGAs, or <B>diode-connected transistors</B>.<BR/><BR/>The remote & local temperature sensors have <B>extra features</B> to enhance temperature measurement such as beta compensation, series resistance cancellation, programmable non-ideality factor, programmable resolution, programmable threshold limits, minimum and maximum temperature monitors, diode fault detection and a temperature alert function.<BR/><BR/><B>Applications</B> that are suitable for remote & local temperature sensor usage include telecommunications and network infrastructure, thermal management within computer systems, electronic test equipment, office electronics, industrial and medical equipment and LCD/DLP®/LCOS projectors.